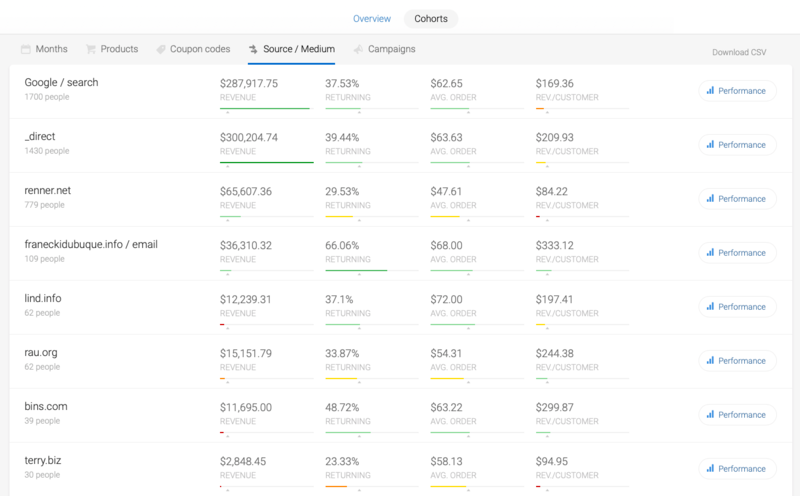 Two of the cohort breakdowns available in the Retention analysis by Metrilo help you measure the long-term results of your marketing efforts and evaluate them against the cost. These are the Cohorts by Source/Medium and Cohorts by Campaign. Referral/ Influencer10 and so on. This way, you see where the best and worst traffic comes from and how people from different sources act as customers in the long run. Do they shop often or only once? Do they stick around for a long time? You will be able to adjust your efforts and shift marketing money to the best performers and not waste your time with channels that simply don't bring you quality customers. This breakdown lets you compare cohorts by the campaign that converted them. It means a lot what kind of a marketing message, incentive, products draw people in. With Retention analysis you see how the different customers who were drawn by different campaigns behave over time. Then, you can decide which campaigns to replicate and invest more in 0 maybe the ones bringing high LTV customers or the ones with a short time between orders, depending on your business goals.